Happy Monday everybody. It’s Heather and I’m excited to welcome author Jeff Bennington, who is doing a blog tour for his new supernatural thriller, REUNION. I loved this book and I reviewed it yesterday! It was very hard to put down, but I did need to eat every now and then. You can catch my review here. I definitely recommend that you add this to your reading list. Be sure to check out an excerpt of REUNION, book trailer, and giveaway rules at the end of this post. Now without further rambling on my part, here’s Jeff. Hi, Bewitched Bookworms. Thank you for having me. 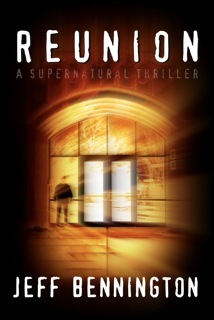 And thank you for helping me introduce REUNION, a supernatural thriller, to the world of bookworms everywhere. Before I tell you about my ghostly experiences, I want to remind everyone that I’m giving away 2 FREE Kindles on May 15th – one will go to one lucky REUNION Blog Tour follower and one will go to a REUNION Blog Tour host. For details about the book, the Kindle giveaway rules, blog tour dates, and blog topics, go to jeffbennington.com. One of the joys of being a writer is that I never have to tell if I’m writing about my own experiences or my fears. But today I’m going to share both. That’s right. Call it a relapse from my days of playing truth or dare, but I’m going to tell you my secret for writing frightening fiction. Are you ready? Good. The secret is… tell the truth. Seriously. That’s my secret. And here’s why it works. Basically, I’m a rather jumpy person. I’m afraid of my own shadow and I’m overly sensitive to ghostly matters—you know, dead people. Well, not dead people per se, but the spirits of dead people. The first experience I ever had was in my home in Aurora, Ohio. I think I may have been about 12 years old. I was hanging out in an extra room in our basement at the time, lying on the floor, listening to Bruce Springsteen or R.E.O Speedwagon, or something like that. Anyway, the lights were out and no one had been down there except for me. I faced the opposing wall; the one attached to the laundry room, a dark and creepy place when the lights were off. As I lay looking and listening, a shadowy figure walked out of the dark laundry room as if part of the darkness inside had broken off and taken on the shape of a man. It didn’t make any noise. It turned its head very slowly as it walked, peering in my direction, acknowledging my presence and then walked on. My heart pounded, beating louder than the music. I couldn’t move, and I couldn’t talk. I just stared into the darkness praying to God that that thing, whatever it was, didn’t come back and swallow me whole and spit me out. I don’t know how long I lay there waiting, praying, and shivering, but it felt like forever. I eventually gathered up enough courage to get out of there and then ran upstairs where the rest of my family was probably watching TV. My day job requires me to walk a regular route a few times a night through a basement in an industrial complex. It’s loud and generally well lit. But there is this one location that really creeps me out. Every time I walk there I get this strong sensation that I’m being watched or that someone is right there looking over my shoulder. Most days, I get a tingly sensation, like the hairs on my neck and arms are going to tear out of my flesh. The feeling rushes through my spine and I get the hell out of there as fast as I can. The funny thing is, I work with a guy who’s had a similar experience that sort of freaked him out too. Note: We never discussed this until that day. He started in. I was obviously very interested, quietly waiting to hear the location. He continued his tale and as it turns out, it was the exact same spot. He felt the same thing – the brooding feeling that he was not alone, chills and all. As easily frightened as I am, that really freaked me out… but I still go down there – every night. Although I enjoyed writing my first book, a political thriller, I find that I’m especially interested writing about the supernatural. They say to write what you know, so I do. I’m writing about scary stuff, my fears, and the feelings I get when I see my own shadow on a dark chilly night. I think real life experiences help to make a story believable and I think most people can relate to a fear of the dark, the unknown, and the shadow creatures that walk through their homes late into the night, peering into their bedrooms, causing the floorboards to squeak. Do you know that feeling? I’d love to hear your stories. Thanks for reading. Be sure to “follow” Bewitched Bookworms Blog, reading and commenting regularly. Then go to jeffbennington.com to learn more about REUNION and the blog tour. And most importantly, be sure to show your support by purchasing REUNION on April 15th so it can shoot up the rankings through buying en masse. Peace. Jeff Bennington is the author of REUNION, a supernatural thriller, Killing the Giants, a political thriller and The Rumblin’, a short suspense. He lives in Central Indiana with his wife, four children and two stray cats. 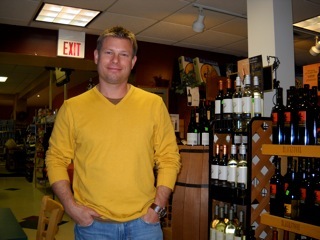 Jeff grew up in Saginaw, Michigan, moved to Aurora, Ohio in 78′ and finally settled in Central Indiana where he met his wife and graduated from Indiana University. He’s an occasional runner, life long drummer and household handyman. Over the years, he’s done everything from working on an assembly line, installing HVAC units, and teaching Sunday school, to running his own business. But through it all, he’s always loved to write. In 2006, something finally clicked when he heard the call to begin writing novels – and write he did. Like many writers, he claims to have a book or two that the world may never read. His hope, however, that the ones you do read will be good, inspiring you to think about life in a way that perhaps you hadn’t before reading his work. Killing the Giants was his first novel, a political thriller, self-published in 2009. He went on to write REUNION, The Rumblin’, and then Act of Vengeance (coming late 2011), his third full-length novel and second supernatural thriller. He blogs weekly at The Writing Bomb, about the world of writing and indie publishing. Thanks, Jeff, for the great post! I’ve had my own ghostly encounters, but I’ll post that in the comments below. For those of you who’d like a sneek peak of REUNION, Jeff has generously provided an excerpt and the trailer, both posted below. Crescent Falls, Idaho 7:30 a.m.
David Ray stood in front of his mirror, dressed to kill. I look good, he thought, like the real deal, like a real killer. He narrowed his eyes, grit his teeth and unfolded his checklist. Sharp blades of black hair dangled in front of his face, covering the brownish rings that encircled his eyes. He peered at his scribbled writing and read the list as he felt his insides tense with hatred. This is it, he thought. No room for mistakes. David had learned over time that life needed to be carefully navigated to avoid pain. He had come to the conclusion that the only way to control his life was by controlling the lives around him. The list helped him stay on track. He paced back and forth, quietly going over the details of his plans as his adrenalin increased. He slouched down at his desk, clenched his hair as it draped over his eyes and pondered how the neglect and abuse he’d suffered had snuffed the music from his soul. David longed for old, familiar melodies to bring him comfort and laughter, but found only the clamoring sound of an off-tempo dirge. Although he tried to arrange the chords and time signatures in a way that was intelligible to his ear, he stepped out of time, his notes were flat, and those around him cringed and laughed. He was humiliated and he hated them for it. He glanced at a picture on the desk of his mother holding his hand as a young child. It stood in a bright red clay frame; a misshapen art project from the fourth grade. Neither of them looked happy, and a lot had happened over the past eight years. Smiles were a rare commodity in their household. He turned the picture face down and stood up. David walked to his small window. He pushed the roll-up blind to the side, peeked through the glass and watched the fog sinking into the sage-covered valley to the east. He observed the sun stretch its arms over the rocky hilltops to wake the ponderosa pines and heard the mountain bluebirds singing in the distance. For the last time, he witnessed the river in the valley, flowing downward in search of rapids and lower ground. He stared into the gorge with cold and unfeeling eyes. The sight reminded him of the time when Bill, his stepfather, had taken him down there and let him shoot his shotgun just for fun. David knew the activity was meant to keep him silent, a form of hush money. Peering through the dirty glass, he thought about his plan to finally get even with everyone who’d taunted and bullied him. Today was the day they’d finally get what they had coming to them. Today the world would sit up and take notice of David Ray. Those kids and their families would be sorry. Now they’d know some of his misery. They could kiss goodbye their happy days of Mom’s cookies, home-cooked meals, and playing ball with Dad. A sliver of sunlight struck his eyes. David squinted and released the window blind. He preferred the darkness. At 7:41 a.m., Tanner Khan climbed onto the yellow school bus, walked down the aisle greeting kids around him, and then took his usual seat by the window. As the bus continued to fill up, the tranquility of the early morning hours escalated to the clamoring roar of cracking voices. Tanner pressed his face to the window and breathed, creating a foggy circle that came and went with each breath. He drew a smile with his index finger. The bus stopped, and Tanner’s best friend Kenny climbed on and waved at Tanner. Kenny traipsed down the aisle, lugging a large duffle bag filled with books. He was skinny and stood six feet tall. Tanner was six inches shorter and far less developed. Both were seniors. Tanner had a baby face with blonde hair. Kenny had brown curly hair with a square jaw line and strong green eyes. As always, Tanner took note of Kenny’s cool look of confidence. “Hey, Tan. What’s going on?” said Kenny. He sat down and plopped his bag into his lap. “Me too.” Tanner looked back outside. Tanner felt Kenny shift his weight and turn in his direction. REUNION is available on April 15, 2011 at Amazon and Smashwords. You can also check it out on Goodreads, where Jeff is giving away two signed copies to Goodreads members between April 1 and May 15, 2011. #1. Buy REUNION and email your receipt to reunion.kindlegiveaway@yahoo.com by May 13th. #2. Comment on one or more blogs on the REUNION Blog Tour. hi Bewitched Bookworms! hi Jeff! i don't consider myself sensitive to spirits and ghosts. thank goodness or i would probably freak out! Hi AO. Thanks Heather! I can't wait to hear your story. And AO, you should be glad you're not sensative. If my wife as much as brushes my leg with her hand…even if we're making eye contact… I jump! Seriously. I worry about myself sometimes. As a Christian, I believe there is a supernatural world that is here and now, surrounding us in this world. It is these "events" that allow us to see a glimpse into this unknown realm. I can relate to your work experience as we are currently house shopping and last week I was looking at the full unfinished basement of a house built in the early 1960's. Everything appeared normal until I walked until a separate room when instantly I had chills all over my body and was terrified to my core. I didn't see anything out of the ordinary but I am confident there was something supernatural in that room. Needless to say, we continued looking. Thanks for sharing your story Jeff. I'm looking forward to reading your "Cabin Experience". Thanks for stopping by. You probably made the right decision with that house. And I can't wait to talk about Earl…Earl the not so friendly ghost (cabin story). There's a lot of events in life that can't be explained. My sister and I have experienced a few strange incidents. Luckily, I can still check back with her to confirm that they really did happen. Your book sounds fascinating. I hear what you're saying, Brenda. There definitely is a "am I crazy?" process you must go through, much like Nick in REUNION. Thanks for the comment. I've had several of these experience through the years, usually some degree of creepy, freaky or weepy, including the time I woke up to see & feel my german shepard sleeping at my feet like he had for years before he was hit & killed by a car, or the time my grandfather came to say goodbye to me in a dream the night he died. I've had more freaky/weepy type of encounters so I'm more fascinated than afraid, but I LOVE reading stories like this that have more scare in them!! I don't believe in ghosts, but that hasn't precluded me from my own eery experiences. Only when I was a kid or teen, though. Nothing since. Still, the ghosts and apparitions are great stuff for both antagonists and atmosphere.